1 What are papayas (Carica papaya) ? 1.2 How are papaya fruits? 1.4 Where do papayas grow? 1.6 Which are the best papayas? What are papayas (Carica papaya) ? Papayas (Carica papaya) are trees that can reach up to 9 m in height when grown, but which seldom exceed 2 m in the wild. Also called papaw, or pawpaw, they are plants of the Caricaceae family that includes about 70 species. A papaya tree has got a hollow trunk, dark green or purple, with no branches except a few ones that are born at the top, reminding those of palms. The plant, when broken, exudes latex. The leaves are palmate-composite, alternate, till 80 cm in length from which the petiole is about half a meter long. In the wild, a papaya is a dioecious plant, meaning that there are male trees and female trees, however cultivation has achieved hermaphrodite trees. Male trees produce tubular yellow flowers in panicles 10 cm long with flower stems up to 50 cm in length. The flowers of the female trees are very succulent and have short stems. They can grow solitary in leaf axils. From the axils of the leaves, the hanging fruits grow, forming dense clusters. Each fruit can reach 70 cm in length and weight up to nine kilos, but more often in the markets of non-producing countries one uses to find pieces from almost half a kilo to a kilo. The fruits are berries with a very tasty meat. Inside them, we find the black seeds surrounded by a gelatinous layer. Papaya fruit is usually like a French melon, where it comes the English family name of “tree melon” – There are varieties that resemble bananas or pears. Papaya pulp is yellow flesh or salmon. In Latin America this tree is also known as tree melon and the papaya fruit is called melon sapote, tropical melon or lechosa (lechosa = milky). Papayas generally have a sweet taste that may vary from one species to another flavor with a hint of musk. In the wild, papayas are dioecious plants, meaning that there are male trees and female trees. However, it is very curious the fact that they can quickly change gender. These changes can respond to both seasonal factors and human actions. For example, branches of samples that were born males whose trunks were cut can produce female flowers after sprouting. The high temperatures of summer can make them bloom. There are some varieties of papayas that can produce flowers of different sexes on the same tree throughout the year. They are trees that grow in warm places where there are no frosts. Temperatures of 0 º C for a short time rapidly damage these trees. Relatively low temperatures waste the fruit quality. Outside their native place, they should be grown in greenhouses on rich soils, provided they have good drainage. They need abundant watering and lots of sun, because, although they may be bearing fruit in the shade, these will not be sweet if the plant does not receive direct sunlight. It is usually reproduced from seeds that grow very fast as they can bear fruit the first year. Its vegetative life stands over 5 or 6 years. It is a very popular fruit in South America where it is also known by the names of papaw, papaya and fundamentally lechosa (milky papaya). Papayas were exported throughout Southern America by the Spanish and Portuguese in the sixteenth century. They were the first to mention the existence of this fruit for the first time in written texts. Today, its cultivation is widespread in all tropical and subtropical countries. Of all the most common species, Carica papaya is the most exported species to most Western countries. Although this species comes from the south of Mexico, it can be grown in Central America, South America, Africa, Florida, India and Thailand. The main countries that export papaya to Europe are Brazil, Costa Rica, United States (Hawaii Island) and Thailand. Other producing countries are India, China, Peru and Mozambique. The most appreciated variety is called “Solo” (=only) with a very sweet flesh. The name “Solo” refers to the idea that this fruit should be eaten alone, with no other fruits accompanying it. The second most important variety is “Bahia” having a more acidic taste. 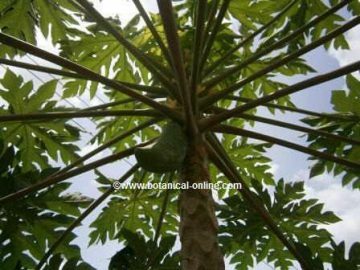 Which are the best papayas? The best papayas are those that have been collected well ripe from the tree as they have higher sugar content and, above all, they are richer in aromas. This is a fruit that does last for long after it has been cut from the tree, so it is collected when unripe if it has to be exported. Species that are green and have not stopped growing can be cooked as if they were zucchini. Being tropical plants, they can produce fruit throughout the year, so we have them whenever we want. Gradually, this fruit is no longer considered as an exotic fruit and can be seen more frequently in the markets in any season but its peak production is in early summer and autumn. – Hawaiian type: They are the most widely exported and consumed worldwide. They are shaped like pears, weighing about half a kilo. Their fruits show a clearly yellow flesh when ripe. Trees are small and very easy to grow. They have small seeds. – Mexican type: The produce larger and more elongated papayas, weighing more than four kilos and almost 40 cm in length. Their meat, in addition to yellow, can also be pink or orange. Their flavor is not as sweet as in Hawaiian types. 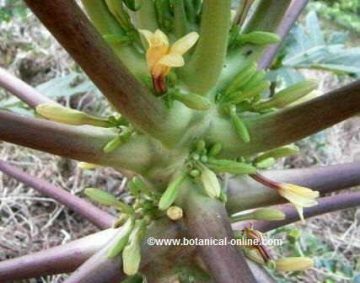 – Mountain Papaya (Carica pubescens): It grows in tropical mountains, being smaller than the last. 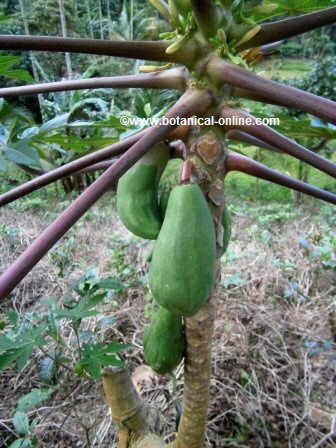 – Wild Papaya (Carica goudiotana) In can adapt to no so warm climates. Its yellow seeds are toxic. – Babaco (Carica pentagona) is shaped like a cucumber. It has been adapted to non-tropical areas of Europe. It lacks seeds and its skin can also be eaten. – Chamburo (Carica estipulata) Very abundant in the wild in Ecuador, although it can be easily grown from cuttings. in humid climates where the sun is not so strong. – Myth (Carica candidans) A type of papaya that grows wild in the Peruvian steppe. – “Higuera de monte”, Oak leaved papaya (Carica quercifolia) It looks like the fig tree by the shape of its leaves. The fruits have lower quality than the milky papaya.